By way of background, our two targets are both going though some challenging medical dilemmas. Chelle's of two minds, you might say, and Da Old Man's been spiralling in an endless vortex of medical maelstroms, hospitalized since early summer. I've decided to roast each of my blogging buds separately. Today, Chelle is the object of my afflictions and tomorrow DOM. Or to put it more succinctly: today the schizoid, tomorrow the whorled. 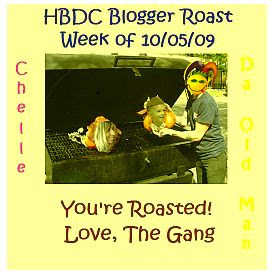 Chelle splits her mind and her time between two blogs. Not only does she run the web's wackiest home for humour hipsters but she also likes to alienate them and anyone else who might drop by her other blog The Offended Blogger. There she shares her own warped and wacky approach to world events while sipping back on a tequila or two while munching a couple of tacos fresh from her local neighbourhood dealer Jesus (no, the other one). But in summing up, Chelle, I really do love you for your mind, whatever condition it's in. And even though you monkey around with the look and style of HBDC more than a three year-old with ADD on Ritalin it's the greatest spot on the Internet. Thanks for letting us all play there. And be well! Great job there, dufus. Love the photos! UR: Not offensive enough? We'll let her be the judge. She's the expert! subby: To my mind she looks like Chelle. Well I wouldn't know about the steins. Me-Me: It was a fun post to write. Quirks: Yep, she's got some unique musical tastes - hooyah! Nice job! I'll pass on the steins but those hot man parts? Mighty fine. RG: hahaha - well I guess there's a little something for everybody there! I'm adding that shot of Till and his flaming "mein teil" to my wall of worship, thanks! I share your sentiments completely. Although I would like to add that she eats meat and slaughters innocent little animals in her quest for more and more meat. Just beware her mighty crossbow and aim. It's a killer! Don: Thanks for the heads up. Now you're scaring me! Love it!! Would it be too weird to admit I'm jealous of those "steins"? nips: They certainly are big jugs...of beer.